On the 23rd Feb 2017 the IOA will be attending a meeting with DEFRA/NE officials in London to discuss the ringing of Siberian Goldfinches/Bullfinches which as in recent years become an issue for breeders as this bird as become more popular and breeders are beginning to bred them in increasing numbers. Continental breeders place “D” rings on Siberian Goldfinches and “E” rings on Siberian Bullfinches. It is hope that discussions on the 23rd will result in a positive approach towards the ringing of these birds and having both species placed on a General License for ringing. The IOA will be attending the Stafford Sales Day on the 4th March 2018. You can pay your membership and order your rings. The IOA are now a fully paid up member of the government department called SUN/DEFRA . On the 12th Jan 2017 Alan Robinson attended a meeting in Bristol along with Bob Partridge from the BBC (who are affiliated to the IOA) to discuss the change in the law re birds and ring sizes. 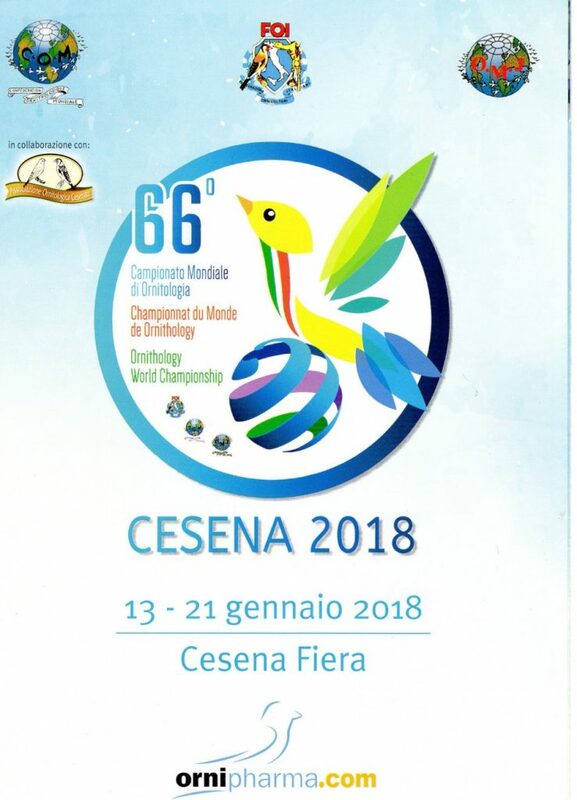 The 66th World Show will be held in Cesena, Italy. The show opens to the public from Friday 19th Jan 2018 until Sunday 21st Jan 2018.